Although it seemed to take Mother Nature a little while to catch up, signs of spring have been in the stores for quite a while now. Whereas retailers used to have stock in snow shovels and triple-warm gloves, shelves are now filled with flower and vegetable seeds and pastel plastic eggs by the dozen. But while selecting which kind of tomato to grow in our yard is a task that fills me with hope, looking at aisle after aisle of Easter candy does not. Do my kids need yet another basket of candy and chocolate that is just going to get tucked away in a cupboard and, most likely, slowly eaten by me? Not this year, they don't. Because there's no better way to fill an Easter basket with creative, fun, entertainment-providing products than by turning to the always-unique and innovative items from VTech. Since 1980, VTech has been developing high-quality, educational products that enrich children's development, from birth to preteen, through fun and smart play. 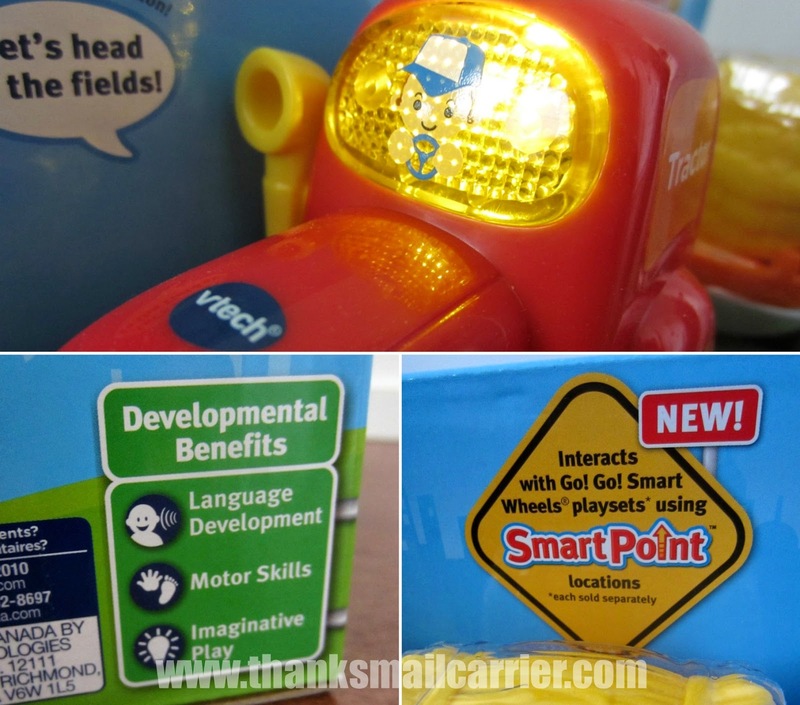 Their award-winning items have long displayed why VTech is a world leader of age-appropriate learning products and this spring is no exception! So, when it comes to finding the perfect candy-alternatives for Easter baskets, I wasn't surprised when VTech came through with exactly that. Having adored their InnoTab Learning App Tablets since their arrival, Big Sister E and Little Sister B were extremely thrilled to add the InnoTab Doc McStuffins and Sofia the First software cartridges (MSRP $24.99 each) to their collection. These are two characters that they both adore! 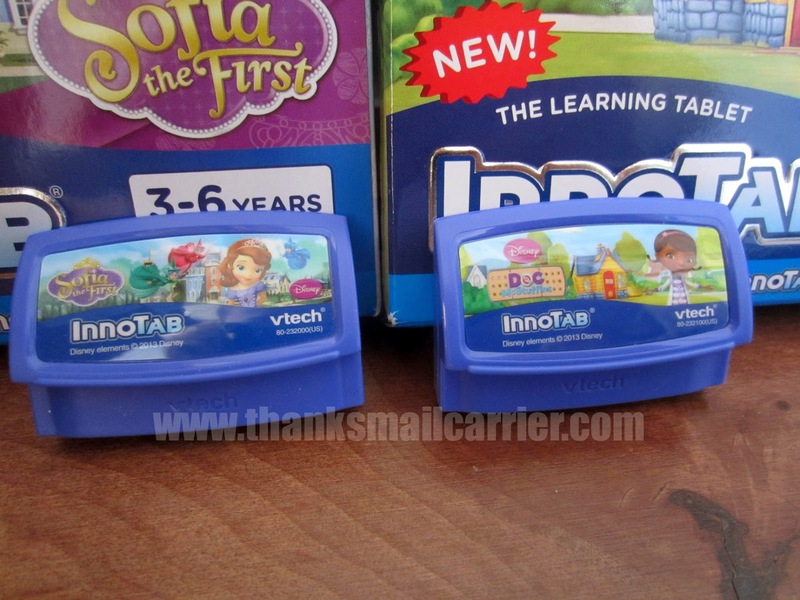 I love the way that VTech makes their cartridges compatible with any version of the InnoTab, so no matter if your child has the original InnoTab or the newest InnoTab 3S, they are able to partake in all of the games and activities. Simply pop in the Doc McStuffins software (ages 4-7) and your child is ready to learn reading, vocabulary, observation, logic, memory, math, visual skills, creativity, healthy living and more! From giving toys a check-up, reading an e-book about Lambie and Doc, coloring in Doc's Big Book of Boo-Boos, taking pictures with different beloved characters, remembering dance moves, and much more, there's no doubt that the Doc is in! My girls can't get enough of being a part of the Doc McStuffins gang and have been returning to fix the ouchies time and time again! When they aren't mending boo-boos with Doc, Big Sister E and Little Sister B have also been excited about diving into the world of Enchancia with the InnoTab Sofia the First software cartridge (ages 3-6). Containing seven different learning games and two creative activities, this software manages to teach counting, colors, shapes, patterns, problem solving and more, all while keeping kids entertained as they help Sofia get to class on Jumble Day at Royal Prep. 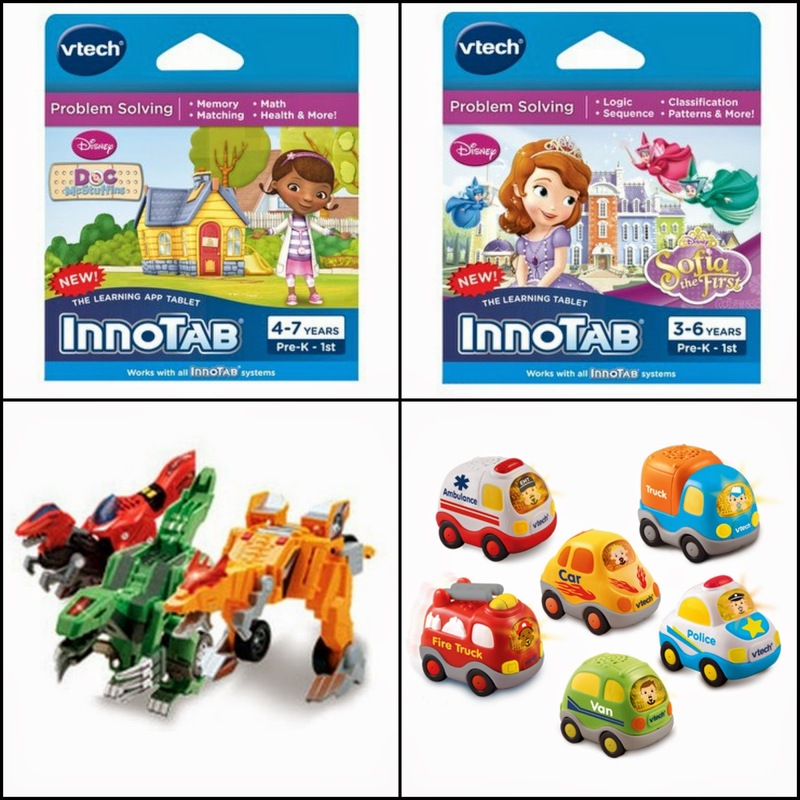 As with all of VTech's great InnoTab cartridges, this one includes a wide variety of options for children to choose from each and every time they turn it on. Take Flying Horse Riding Class with Sofia and Minimus, create magic paintings with Sofia in Art Class (and tap the magic wand to watch them come to life), learn how Sofia becomes a princess in Story Mode with the interactive e-book, take pictures with favorite characters and scenes, and more. What better way to spend some time learning and laughing than by marveling at all that is topsy-turvy with Princess Sofia and her mixed up classrooms? Both of these cartridges have been entertaining Big Sister E and Little Sister B since their arrival (which was just in time for our recent vacation to Disneyland) and they were perfect for quiet play on the planes and during downtime! As well as innovative new InnoTab software cartridges, VTech has plenty of other creative and fun Easter baskets ideas for kids of all ages. While we weren't familiar with their adorable Go! Go! Smart Wheels Vehicles (MSRP $7.99), we were immediately impressed with the way that these electronic play vehicles are perfectly sized for little hands (they are designed for ages 1-5). Available in 12 different vehicle options — car, van, truck, ambulance, fire truck, police car, tow truck, helicopter, cement mixer, tractor and two race cars — each Go! Go! Smart Wheels easily combines entertainment with education in each bright, colorful piece. Little ones are able to learn about different letters and vehicle names through pretend play, while having fun with the light-up button that activates music and sounds. The fun never ends! This adorable Go! Go! Smart Wheels Tractor plays melodies, sounds, teaches the letter T and would even say over forty unique educational phrases if interacted with the SmartPoint locations on the many Go! Go! Smart Wheels playsets (each sold separately). It all adds up to playtime with miles of learning! When it comes to interactive fun for slightly older kids, however, my girls have both loved playing with Zipp the T-Rex from the Switch & Go Dinos Turbo Assortment (MSRP $9.99). Designed for ages 3-8 years, these transforming dinos switch from being a ferocious beast to a rugged vehicle and back again in seconds! On top of that, kids can rev up the action with the flywheels that let the dinos race and roar across the floor while listening to the realistic vehicle and dinosaur sounds and phrases! I can't stop laughing at how much fun Big Sister E and Little Sister B have had transforming Zipp back and forth between being a super-sleek race car to a scary dinosaur with razor-sharp teeth... as well as pressing the talk button to learn interesting dinosaur facts and the sound button for great effects! The range of Switch & Go Dinos now features six new characters, including Dart the Triceratops, Zipp the T-Rex, Spur the Stegosaurus, Fray the Ankylosaurus, Cruz the Spinosaurus and Spinner the Stygimoloch, and really do combine the best of both worlds in terms of cars and dinosaurs. My kids haven't stopped transforming Zipp back and forth and marveling at the way that he can be an electronic, fierce dinosaur or a race 'n ride car so quickly and easily! This year, instead of loading up on chocolate and candy, head over to the VTech website to see how you can create a toy-tastic basket that will help extend your little one's learning and fun with so many of their best-sellers that your kids will surely love! VTech consults with a panel of experts on the development of its learning products and supports you as your child continues to grow and reach new developmental milestones by offering a variety of age-appropriate toys. What better gift could they (and you) ask for in their basket? 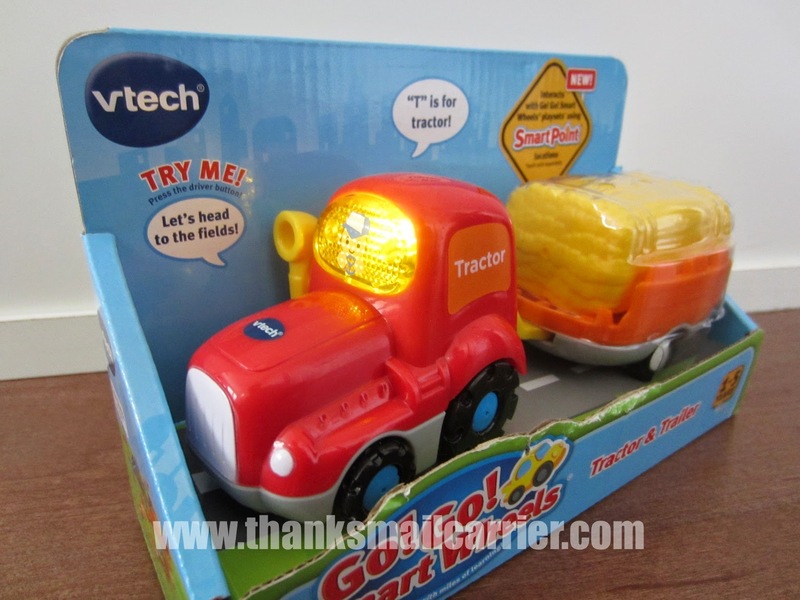 One lucky person will win a VTech Prize Pack* (ARV $68)! *Prize Pack includes (1) InnoTab Doc McStuffins software cartridge, (1) InnoTab Sofia the First software cartridge, (1) Switch & Go Dinos Turbo and (1) Go! Go! Smart Wheels Vehicle. My five year old would most like the Sofia the First software because its something they have been asking for a lot recently. Great giveaway. My daughter would love the Sofia cartridge. They would love the Doc McStuffins because they love her and playing their InnoTab! I think my grandson would most enjoy the Switch & Go Dino because he loves dinosaurs and vehicles so this is perfect for him! My little grandson would love the cars. He loves to play with his cars! My daughter would love the doc and sofia games because, well, she loves doc, sofia, and games! My boys would love the Switch & Go Dinos! They love dinosaurs! My twins would love the bubble guppies game! My niece would like the Sofia cartridge because she likes the character. My nephew would love the Switch & Go Dinos. He is a huge dinosaur fan, and can't get enough of them. the switch and go dinos, my boys would love them! I think the switch n go dinos would be fun for my grandson. My daughter would love the Go! Go! Smart Wheels. She already has a few and she has loved them since she was a baby. She's almost two now and she likes to sing along with them. Probably the Switch & Go Dinos, my son loves dinosaurs lately. My boy would love this. The cars, the Vtect and the games he would love them all. My twin boys want the dinosaurs badly. And they want more games for their innotab3s. My grandson would like the Switch & Go Dinos. He's really into dinosaurs right now. we want the doc mcstuffins game because my daughter LOVES doc mcstuffins! My daughter would love the Sophia the First game! I think he might like the switch and go dinos. I would like the cars and dinos for my kids! She would like the InnoTab Sofia the First software cartridge. She loves to watch Sofia the First on tv. I would choose the switch & go Dino for my grandson, he loves Dinos. 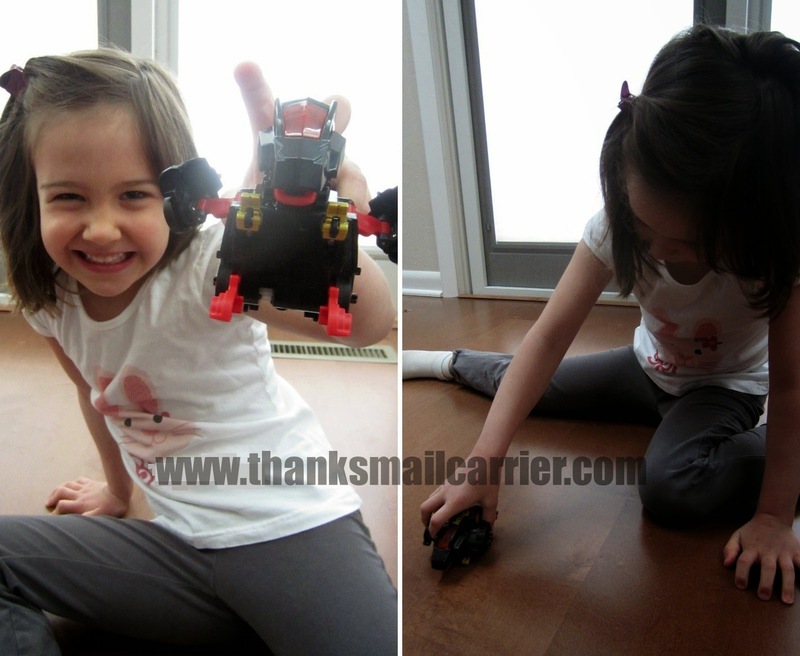 my daughter would love the innotab cartridges since she plays on hers all the time and my son would love the dinos! My two boys would love the Touch and Teach and the truck. We love Vtec and they love the two dogs. Alphabet Activity Cube With Bonus Blocks Set because it looks fun for my little one. My nephew would love the the Switch & Go Dinos Turbo, because he loves pretending and interactive toys! I think my son would love the Go! Go! Smart Wheels Vehicle he loves playing with cars, trucks, trains.. anything that GOES! My grand daughter would love this win. My son would benefit from the VTech's matching, memory and the math tablet. The switch and go dines are cool! Actually, I am not entering for myself and my child is an adult..I am entering to donate this to a children's charity. I think my daughter would be most excited for the Switch 'n Go Dinos. She really loves dinosaurs right now! My son would love any of the go go smart wheels vehicles. My nephew would enjoy the Switch & Go Dinos the most. He is very interested in science and how things transform into things. My son would love the go-go car as he is totally obsessed with any kind of moving vehicle! I like the Alphabet Activity Cube for our granddaughter so she can learn the alphabet. My Grande son...wouldlove the dino go car....My grande daughter when shes a little older would love the innotabs..
My nephew would love any of the cars. Doc McStuffins would be a favorite to my little one! My son would love the switch and go dinos@! I'd like the switch n go dinos for my grandson. I think my niece would love the Switch & Go Dinos. lol, I gave my niece an innotab for Christmas. My nephew would love the switch and go dinos! They roll and transform. The bubble guppies would be a big hit with my niece. My daughter really wants a Switch & Go Dino! I like the Innotab games. my son would love the go go car!! My two boys would LOVE the switch and go dinos! my children would love the innotab with DocMcStuffins, which is their current favorite characters! thanks! My son would like the cars and the Doc Mc Stuffins game! This is a nice set. My nephew would love this and and so would I. This would keep him nice and busy when I'm watching him. The Sophia game for my little girl and bubble guppies for my son , though they both like both of those shows. Super cute! My daughter would love this, she has been asking for it a lot! My nephew would love the Go Go Smart Wheels because he collects cars. My niece would love the go go smart wheels. She's doesn't have many cars so she'd love those. definitely the sofia the first cartridge! My 5 year old son would love the switch and go dinos. He is crazy about dinosaurs and can't get enough of them. My daughter would love the InnoTab Doc McStuffin game because it's her favorite show and she'd love to play the game on her "ipad". My son would love the Switch and Go Dinos because he likes dinosaurs and transformers and these are a perfect combination. 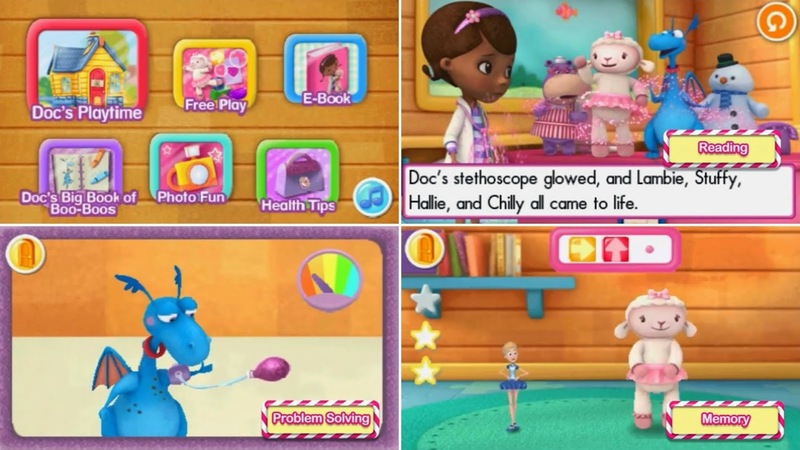 My daughter would love the doc mc stuffins game for her innotab! My daughter would love the Doc MCstuffins game for her innotab that I plan to give her for Christmas this year. We would like the Go! Go vehicles because she enjoys the attractions of light and sound. My boys would love any of them..id like to et them the inno tab. My two grandsons would love the Go! Go! Smart Wheels Tractor with the lights and sounds. Hello! My grandson who is a year and half would love the Go! Go! Smart Wheels Tractor the best. He'd like it because he's at the age that he could play with it. The other toys he'd have to grow into. Thank-you! My granddaughter would love anything to do with Doc Mcstuffins. My daughter would love the Doc McStuffins game! She's her favorite! My son would love the Switch and Go Dinos because he's a huge fan of dinosaurs. We'd love the Switch & Go Dinos! My son would like the Switch and Go Dinos. The boys absolutely love Switch and Go Dinos. Oh, forgot to tell you why---because they love dinosaurs and they love that you can change them into cars/planes, etc. 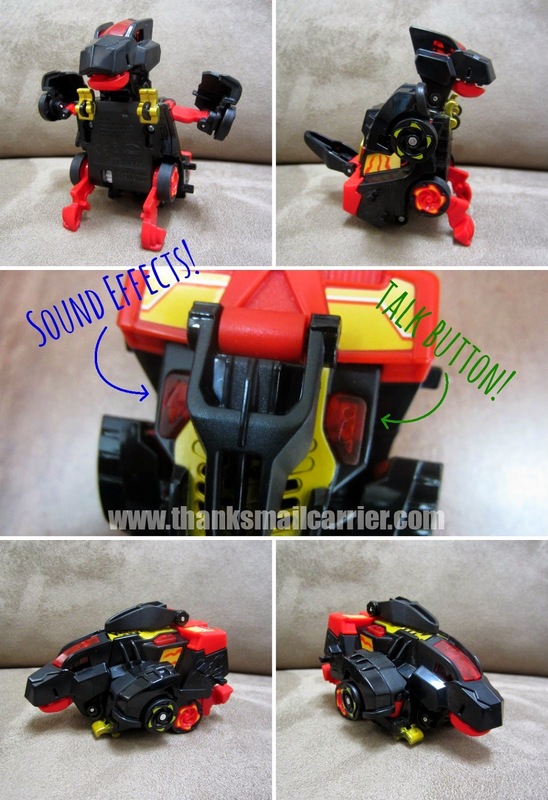 My friend's son would love the Vtech Switch & Go Dinos because he loves Transformers and dinosaurs. We are getting our daughter an Inotab for Christmas (yep....already making a Christmas lost!). She would enjoy the games. the kids would love the transforming Zipp because they love dinosaurs and this would make them so happy. They would like the Switch & Go Dinos because they are entralled by dinosaurs. My son would love the Switch & Go dinos, he always plays with them at the store. The Doc McStuffins software, we have some major fans in our house! The Dinos turbo would be my nephew's favorite. My daughter would love the doc mcstuffins because she watches it everyday. My grandson would love the Switch & Go Dinos he loves dinosaurs anyways so this would be even better. The switch and go dino! My son is in love with dinosaurs! My Sophia would be happy with InnoTab Learning App Tablets, I always wanted to buy her one but money is tight and I this tablet is a great device to have fun and learn too. My son would love to have the Go! Go! Smart Wheels Vehicles. he loves to play with cars. our son would love the switch and go dinos. My son would like some new cartridges for his Innotab and the cars would be great for the toddler. My daughter would love the Princess Sofia cartridge. 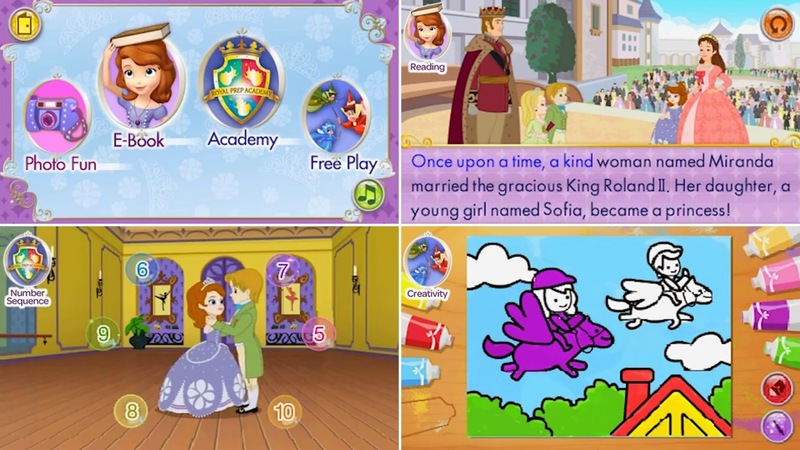 My daughter would like the Sofia The First InnoTab cartridge the best. 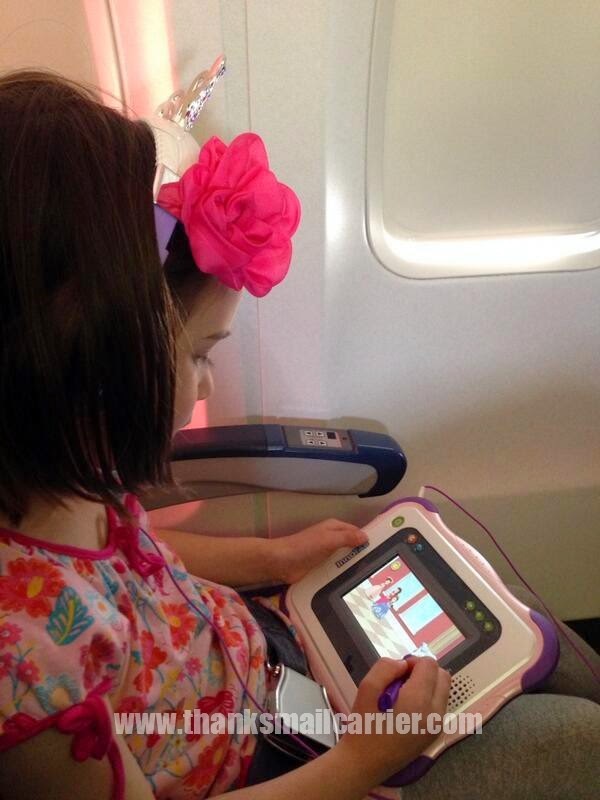 Sofia is her favorite character on TV and she would enjoy a new cartridge for her InnoTab. I think my kids would love the Dinos the most! They're really into dinosaurs right now and those look super fun! She would like the innotab Doc Mcstuffins cartridge. I got her an innotab for Christmas. My son would LOVE the switch and go dino's !! 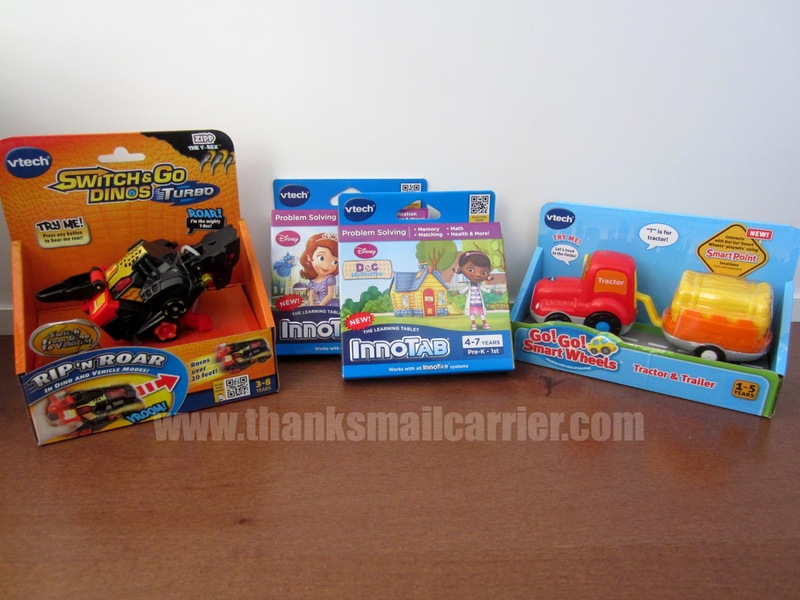 My grandson would love the Switch n Go Dino's because he loves dinosaurs! My son would love all of these products, but his favorite would have to be the Switch & Go Dinos. He is a big fan of anything to do with dinosaurs! Either of the innotab games. My daughter loves Doc mcstuffins and princess sofia! My 5 year old is a huge fan of Bubba Guppies I no he would love that game and my other son would love the Go Dino's. My son would love the Switch & Go Dinos. He has been into dinosaurs a lot lately. He has a few already from other brands that are the transformable type. He loves them, so I know he will love this. My Grandson would love the go go cars. My grandson would love the Go! Go! Smart Wheels Tractor!